Wedding bands first came on to the scene earlier than you might expect. The earliest examples of the tradition trace back to ancient Egyptian times, where spouses would exchange braided rings of hemp, reeds, or leather. To the ancient Egyptians, these circular bands were considered to symbolize eternity, and were meant to join spouses together in eternal life and love. 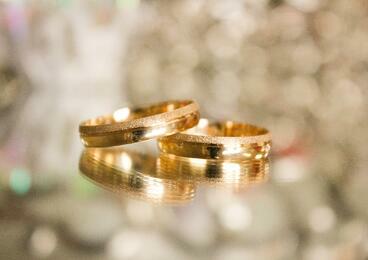 Wedding bands can also be traced back to ancient Roman and Greek traditions. The custom was eventually adopted by Europeans who spread the tradition worldwide and helped bring it into modern times. If this tradition and its meaning is something that speaks to you, take the following things into consideration when looking for your ring. 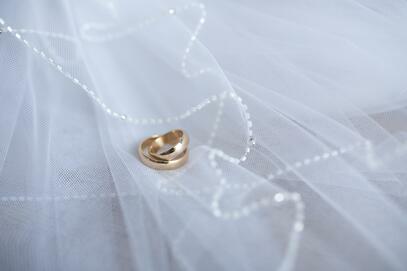 As with anything associated with your wedding, you need to set a budget. While the average price for a man’s wedding ring is $600, wedding bands can cost anywhere from $100 to $2,000, so it’s important to determine a budget for your band before you start shopping. Having a budget can also help you narrow down your ring choices. No matter the budget, you can find the right balance of metal, width, and detailing that’s right for you. White gold – The color of white gold is achieved by mixing yellow gold with a white metal. 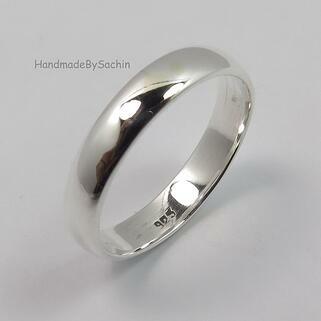 The shine that white gold has is comparable to platinum, though the shine is not as long lasting. White gold is plated in rhodium, which is what takes away the yellow tinge that the yellow gold would otherwise give to white gold. Rhodium plating can be redone every few years once the shine of your ring starts to fade and the yellow begins to show through. Yellow gold – Yellow gold is a classic and a timeless option. Yellow gold rings are available in 9 or 18-carat options, with 9-carat being the harder of the two and therefore, the more durable. Because yellow gold has been the primary material of wedding bands for centuries, it can hold immense sentimental value for some. Platinum – Platinum is one of the strongest and toughest metals. It is also one of the rarest precious metals. Platinum retains its bright, silvery-white color without requiring rhodium plating. It’s a very durable metal that is resistant to corrosion. 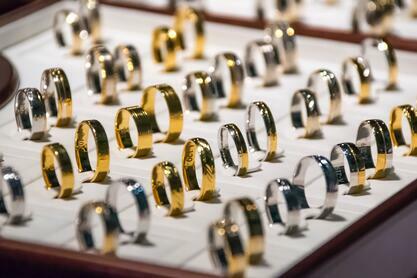 Keep in mind though, as durable as platinum is all rings require some upkeep and maintenance! Palladium – Palladium is great option for those who want the look and qualities of a platinum ring but want a more affordable option. Generally, palladium costs 1/3 less than the price of platinum. Palladium is nearly identical to platinum, both in shine and durability. However, if your jeweler doesn’t have the right equipment, palladium can be nearly impossible to work with if you need it to be resized or altered. Rose gold – If you’ve been keeping up with the trends, then you already know: rose gold is super popular right now. This trendy metal is comprised of yellow gold combined with copper alloys and silver. 18-carat rose gold rings will have a lighter tone than 9-carat rings, which contain more copper. 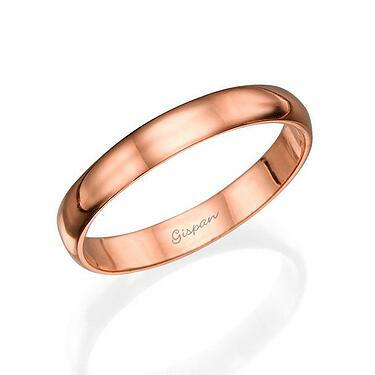 If you’re looking for a traditional ring with a twist, rose gold might be the metal for you. 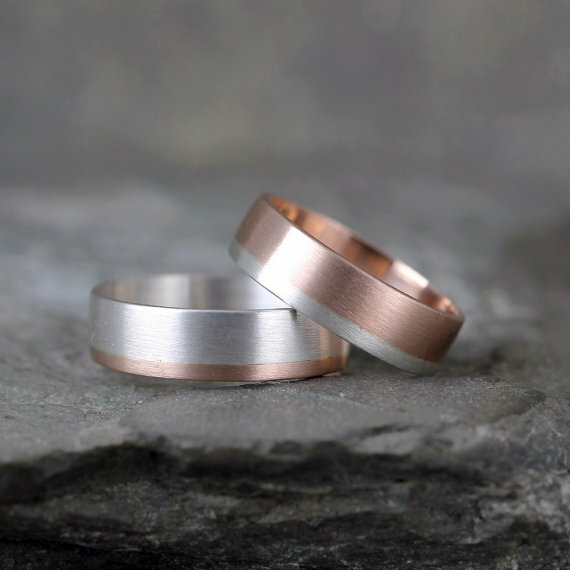 Silver – Because silver is a common metal and easy to source it is much less expensive to buy, making silver rings a favorite among couples on a budget. 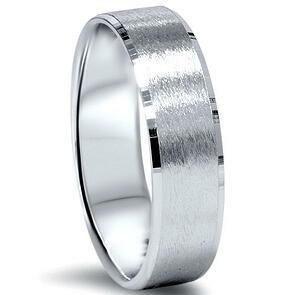 However, because silver is a very soft metal, the ring may scratch or break more easily than other metals. Additionally, silver can tarnish, leaving your ring with a murky hue. In general, silver rings aren’t recommended if you’re looking for something that will withstand the test of time. 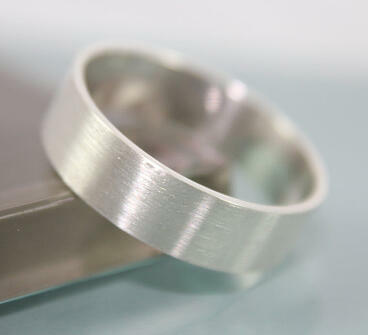 Titanium – Titanium rings are very hard to scratch or dent, especially compared to gold or silver. The metal has a unique dark grey hue. 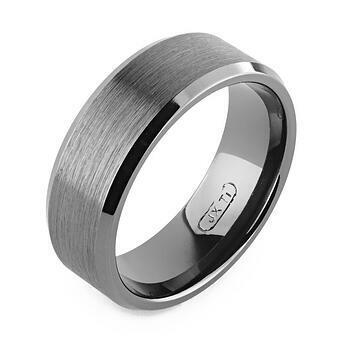 Titanium is also hypoallergenic, making it an excellent choice for men who have trouble wearing other kinds of metals. However, like palladium, titanium rings can be hard to resize. Because titanium cannot be melted down, and resizing a ring involves soldering it, increasing or decreasing the size of the ring is very difficult. Though small solutions are possible, if you need a totally new size, you will most likely have to buy a new ring. 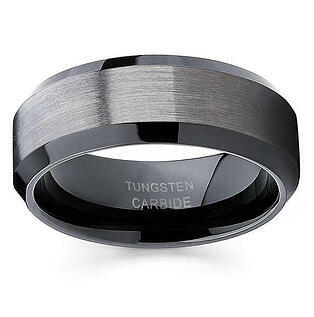 Tungsten – Tungsten is four times harder than titanium and more unique than a traditional wedding band. It’s very lightweight, and most rings have a black or grey color. Titanium is a strong metal that will hold up over time and provides a more unique look than platinum or palladium. Additionally, it’s very affordable. 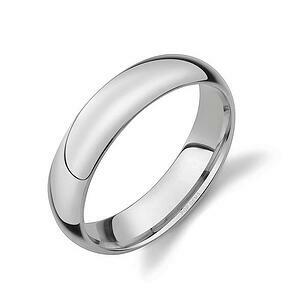 A tungsten ring is ideal for someone who works with their hands a lot and who could easily damage a traditional wedding ring. 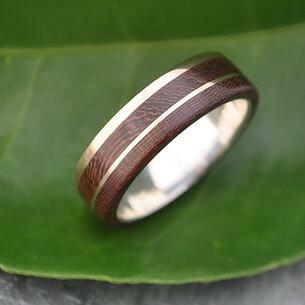 Polished wood – Wooden wedding bands. Really? Really. 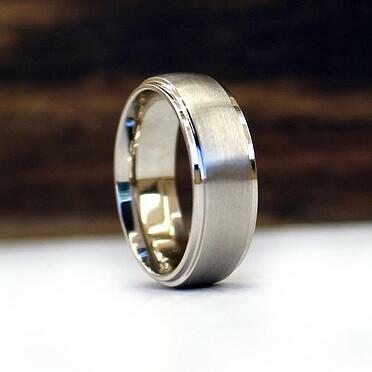 Though this is definitely the choice for the more unique groom, polished wood wedding bands are gaining popularity. Sometimes the wood finish is combined with other metals such as gold or silver, and other times it is used on its own. While the look makes a statement and is very avant-garde, it’s unfortunately not very durable. It can also be difficult to clean. Mixed metal – If you can’t make up your mind, try combining two or more different metals for a ring that’s truly all your own. When considering metal, you also need to consider your day to day. Your ring is something that you’ll wear most of the time, so obviously you want one that fits your lifestyle and unique needs. Are you very active? Do you spend your days working with your hands? 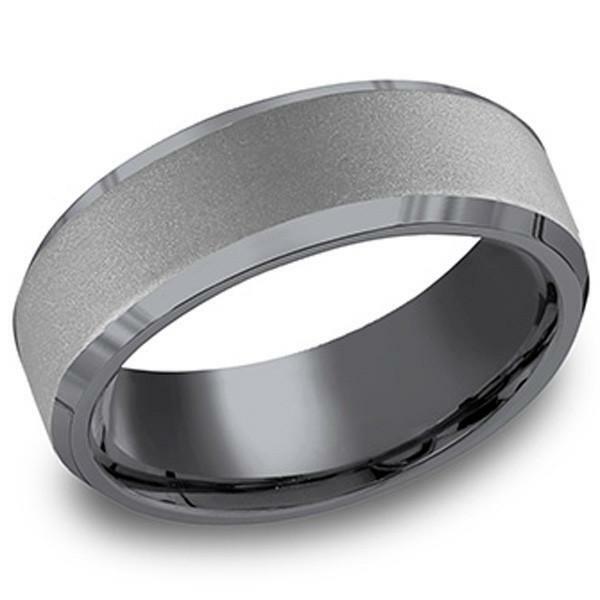 If so, you’re going to want to consider a wedding band that’s made of very durable material, such as tungsten. If you choose a metal that’s too soft, like silver, you can risk damage to the ring. Above all, you own personal style should influence the ring you get. “What’s normal for a men’s wedding band,” you ask? Well, the answer to that is: what do you like? Men often ask if diamonds, mixed metals, or designs in a wedding band are too feminine. There is no right answer. It’s your ring – if you want certain features, or like the look of a particular style or detail, then that’s what’s right for you. The bottom line is, if it’s a design that you’ll feel happy and confident wearing, then that’s the ring for you. Don’t be afraid to let your ring reflect your personal style. A wedding ring is a piece of jewelry you’ll be wearing for years to come. It’s important that you like it and that it reflects who you are. Another consideration is how wide you want your ring to be. The width of a ring can range from very thin to quite thick. This really comes down to personal preference and what you think looks right on you. For example, a man with large hands may feel that a thin ring looks too dainty on him. It’s all about what you prefer. However, take note that wider rings are more expensive as they use more material. You can customize your ring with any additional details that you’d like, such as inlays, engravings, and stones. These unique details are not only reserved for women’s jewelry! Finding or customizing a ring that pays attention to detail can add a lot of character and distinctiveness to your ring. Perhaps the most important part of your ring is making sure the sizing and fit is correct. Proper sizing is key – after all, you (and especially your partner) do not want your ring slipping off and potentially getting lost. When it comes to fit, there are two routes you can take: standard versus comfort fit. A standard fitting ring is flat along the interior of the ring and is common in rings made from platinum, palladium, and white gold. Standard fit is a classic and has been used for years. Comfort fit is newer to the jewelry scene. 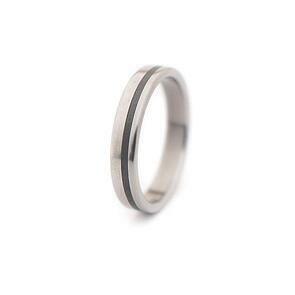 A comfort fit ring is domed on the inside instead of flat, creating a smaller diameter at the edges of the ring. Compared to the standard fit, many men find this fit to be more comfortable (thus the name – see what they did there?). You’ll feel a significant difference between to the two fits when a ring has a larger width. The thinner the ring, the less the type of fit will matter. When you go to jeweler to find your ring size, try on both styles to see which you prefer. Polished – A polished ring is a timeless, classic look. These rings are high shine and have a smooth surface. Matte – Matte finish is also known as a brushed finish. A matte ring is less reflective and shiny. Combination – A combination ring combines polished and matte finishes for a unique look. 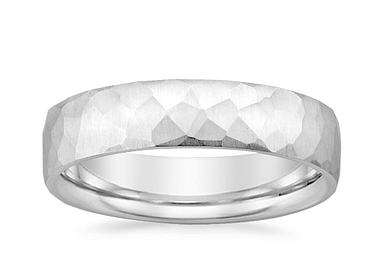 Hammered – If you’re looking to add detail and texture to a ring, a hammered finish is what you’re looking for. Most importantly, remember that choosing a wedding ring should be fun. This is an exciting time for you and your fiancee and, as stressful as wedding planning can be, it’s also a time to enjoy the start of building your lives together. Take the time to reflect on the type of ring that reflects your personality and relationship, and you’ll be set. And, if you discover along the way that your ring is not for you, you can always sell your ring and upgrade to something the suits you better.